A new study, affiliated with UNIST offers decisive proof that South Korea's Ulsan city is affected by toxic substances contained in fine dust particles, regardless of the season. In particular, the emission rates of volatile organic compounds (VOCs) in Ulsan was among the highest in South Korea. Hence, further investigation is urgently needed to manage fine dust in Ulsan region. This study has been led by Professor Sung-Deuk Choi and his research team in the School of Urban and Environmental Engineering at UNIST. In the study, published in the May issue of Environmental Pollution, Professor Choi analyzed the concentrations of the atmospheric polycyclic aromatic hydrocarbons (PAHs) in Ulsan, using the air samples collected at UNIST. The results showed that the PAH concentrations were higher even in summer when the concentration of fine dust reaches the lowest value. PAHs are among the most toxic chemical pollutants, contained in fine dust. Professor Choi noted that South Korea's current analysis methods for measuring the concentrations of fine dust are seriously misguided. In fact, South Korea places more emphasis on the total concentration of fine dust in comprehending their adverse health effects. However, low concentration of fine dust could contain higher level of toxic substances, while high concentration could be based on relatively clean sand particles. "Even if the total fine dust mass is low, the risk to human health depends on the presence of certain toxic substances in it," says Professor Choi. "Therefore, further studies on the component analysis of fine dust are necessary and this time, we have dealt with PAHs." According to the study, the concentration of PAHs in the gaseous and particulate phases are higher in winter (January and February) and spring (March to May) and this is largely due to the ultra-fine dust created in China. Moreover, this has contributed to the increase in fine dust concentration in South Korea, as well as the toxic substances. However, the total fine dust concentration decreased in summer (June to July), while PAH concentrations did not decrease as much in mass. The influence might be due to seasonal winds transporting PAHs from Ulsan's coastal shipbuilding industrial areas, the research team noted. "Ulsan has huge industrial complexes such as petrochemical and non-ferrous industries which are considered to be noticeable emission sources of PAHs," says Professor Choi. 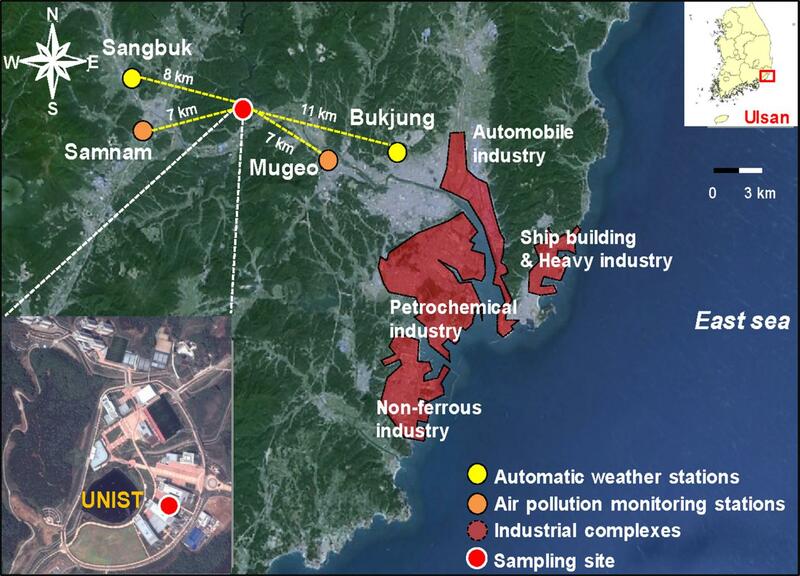 "Therefore, long-term investigations on PAHs in multimedia environmental compartments of Ulsan are essential." "This study shows that Ulsan is affected by toxic substances contained in fine dust particles throughout the year," says Professor Choi. "Besides, the amount of industrial sector-based VOCs, which later converted into fine particulates in the atmosphere via photochemical reaction are not negligible." He adds, "Therefore, instead of blaming pollutants wafting in from China and nearby metropolitan areas, we need to take responsibility for local pollution." According to the research team, "This study contributes to the understanding of seasonal variation in atmospheric PAHs and provides comparable results across three source identification methods: Diagnostic ratios (DRs), Principal component analysis (PCA), and Positive matrix factorization (PMF). Thus, this approach can be used in future studies on source-receptor relations of atmospheric PAHs." This study has been supported by the National Research Foundation of Korea and the 2017 Research Fund of UNIST. Tuyet Nam Thi Nguyen, et al., "Seasonal variation, phase distribution, and source identification of atmospheric polycyclic aromatic hydrocarbons at a semi-rural site in Ulsan, South Korea," Environmental Pollution, (2018).